The FCC air blower line check valves are used to prevent backflow of catalyst from the regenerator. 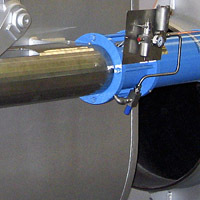 Pneumatic cylinder with spring return. Oil dashpot to prevent undue swinging, chattering or vibrating of the valve disc. External lever with counter weight. Stuffing boxes with bushing made of self lubricated material. Self-aligning disc and disc arm. The body of the valve is usually made of SA 516 Gr70 carbon steel or 304H stainless steel. IMI Remosa however will meet meet any customer request for different nbody and internal materials. The bolted bonnet allows for the maintenance of valve internals without removal of the valve from the line. Disc and seat contact areas are hard faced with cobalt base material. IMI Remosa's non return valves are made from plates and forged materials. No cast parts are used in the valves fabrication.